When it comes to dal, my family doesn’t have many heirloom recipes. 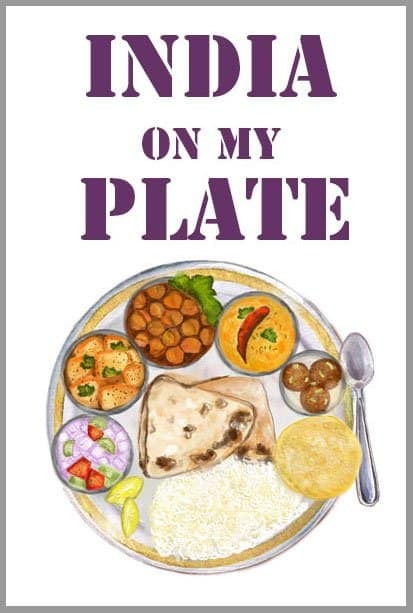 Except for everyday arhar dal fry, dal makhani (that I learned post marriage) or pahadi gahat ki dal, there are hardly any dal recipes in the family. This Panchmel Dal is something I learned after marriage to break the monotony of dal makhani for dinner parties. Over the years, as I grew as a cook, this recipe also got its share of improvisation. And finally, I could say I make a delicious panchmel dal without using onion and garlic. 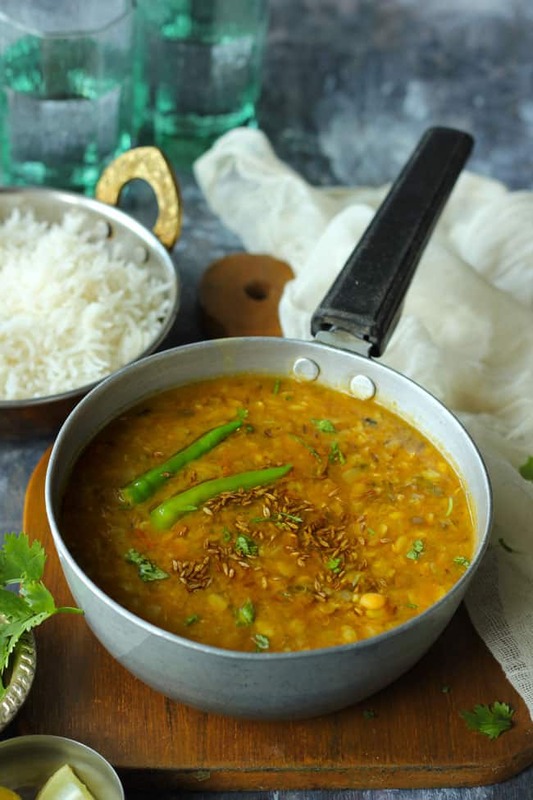 This panchmel dal recipe is absolutely fuss-free and requires minimal preparation time. 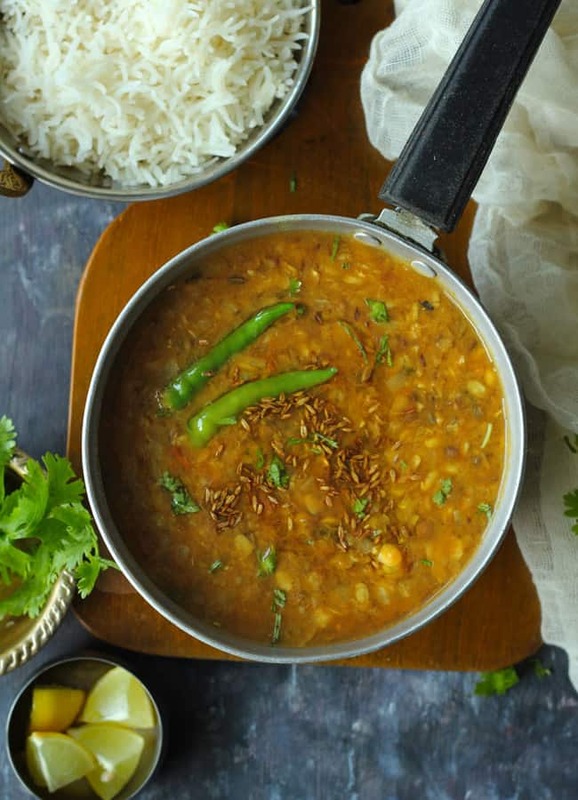 Do you know what exactly is panchmel dal? It is the mixture of five lentils – my favorite arhar dal, chana dal, sabut urad dal (the black one), yellow moong dal and at last the masoor dal (the pink one). You can mix all of these in equal parts at home or you can pick the packaged mix of these five lentils. I usually pick the packaged one. That makes life so much easier. I am always a rice + dal loving person. And that is my ultimate definition of comfort food. No good Indian dinner ends for me without a bowl of dal – chawal mix. It’s food for soul kind of a thing for me. So talking about the panchmel dal, it perfectly fits my criteria of an ideal dal to accompany the steamed basmati rice. Right after the classic arhar ki dal or the yellow dal as we all call it. 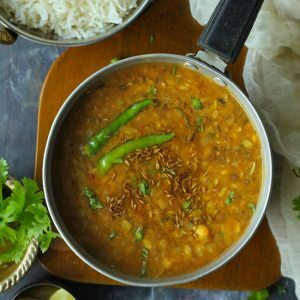 How To Make Panchmel Dal With Onion/Garlic? You can make panchmel dal with onion and garlic as well. How? In a pressure cooker, heat 2 tablespoons of ghee, saute one chopped onion, once golden, add the chopped tomatoes and ginger – garlic paste. Fry till the oil separates from the masala. Add the soaked dal, spices and cook further as suggested below in the recipe. When I add the onion and garlic in the dal, I skip adding the asafoetida. Because I feel the garlic and asafoetida clash with each other when it comes to the taste and aroma. 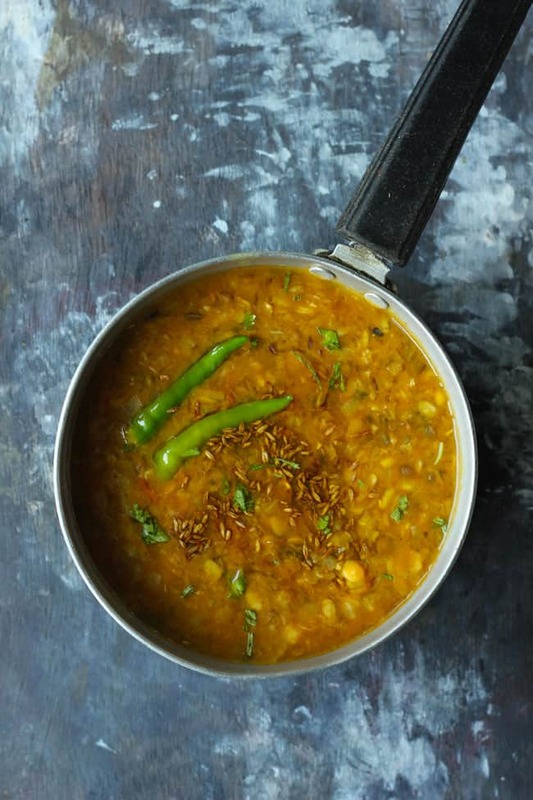 In the end, you can temper the dal with loads of ghee, cumin seeds, and green chilies. It is as delicious as the panchmel dal without onion/garlic. So take your pick panchmel dal – with onion/without, or you can try both the recipes and let us know which one you like best. 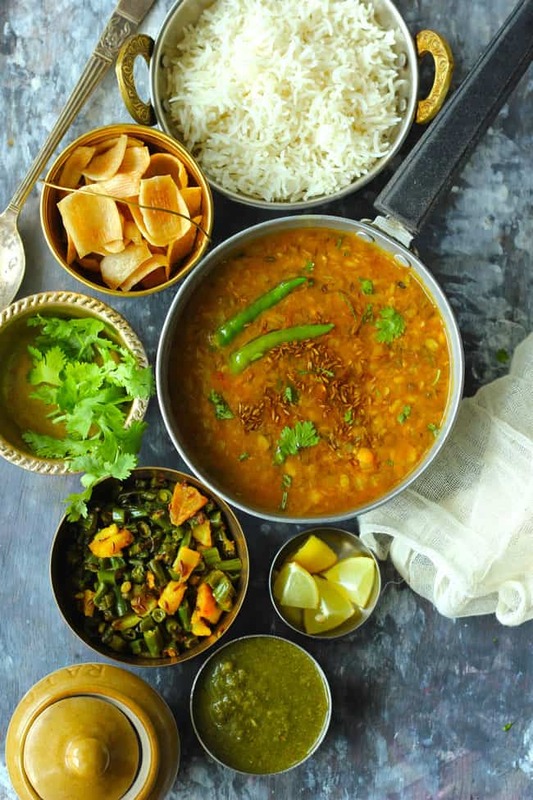 Panchmel dal is a delicious mix of five different dals. Find how to make panchmel dal without onion and garlic in few simple steps. Wash and soak the dal in enough water for an hour or so. After one hour, drain water from the dal. Add dal in a pressure cooker along with chopped tomato, ginger, green chili, spices, salt and approximately 2 Cups of water. Pressure cook the dal over a medium heat for 2 – 3 whistle. Allow the steam to release naturally from the pressure cooker. Open the lid of the pressure cooker and gently mash the dal using the back of the ladle. Heat ghee in a small pan. Add the cumin seeds and allow them to crackle. Next, add the hing and cook for 10 – 20 seconds. Pour this tempering over the dal. Stir to mix nicely. Close the lid of the pressure cooker until you are ready to serve the dal. This way the aroma and flavor of the tempering get nicely mixed in the dal. Serve Panchmel Dal garnished with coriander.